Retinitis pigmentosa (RP) is, with a prevalence of about 1 in 5,000 individuals, the most common inherited retinal dystrophy (IRD). My research conducted at the Centre for Medical Genetics Ghent at the research facility of Prof. Dr. Elfride De Baere, focused on the autosomal dominant form of RP (adRP), representing 30%-40% of all RP cases. Like other forms of IRD, adRP displays a tremendous genetic heterogeneity. To date, more than 1,000 mutations in 29 different adRP genes have been found. Despite of this high number, the highest reported mutation detection rate is only 70%, leaving a considerable fraction of cases unexplained. To assess the contribution of the most prevalent adRP genes in the Belgian population, molecular testing was performed in 86 index patients with possibly adRP, providing a molecular diagnosis in 48 cases (56%). Strikingly, mutations in splicing factor genes (PRPF31, PRPF8, SNRNP200) represented the most common cause, with PRPF31 being the second most prevalent mutated gene (10.5%) . 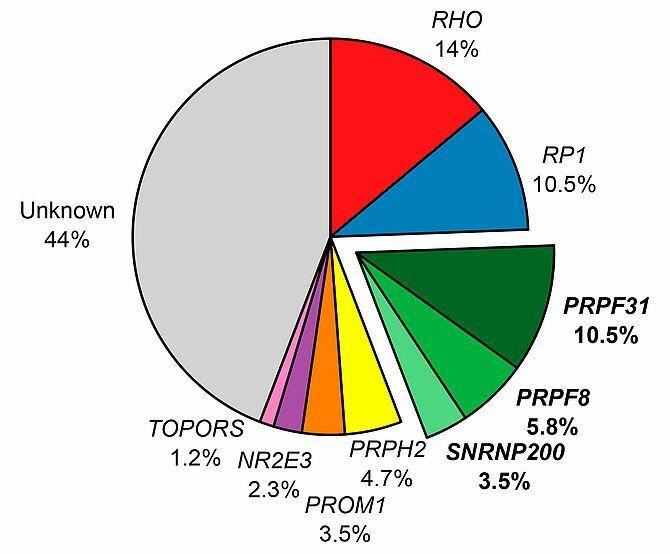 Although non-syndromic forms of RP only display retinal manifestations, seven ubiquitously expressed splicing genes have been implicated in adRP. 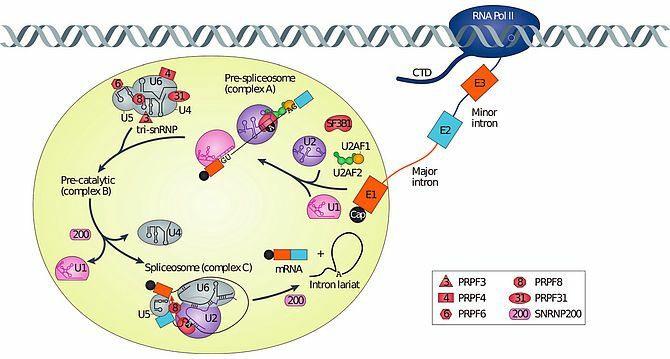 Of these, six encode components of the U4/U6-U5 triple small nuclear ribonucleoprotein (tri-snRNP) complex of the spliceosome. We identified SF3B2 as a novel candidate gene for adRP . SF3B2 encodes pre-mRNA-splicing factor 3b subunit 2, which is a component of SF3b that is part of the U2 small nuclear ribonucleoprotein (snRNP) complex. SF3B2 is involved in the pre-spliceosome (complex A) formation and in the incorporation of the tri-snRNP complex to form the pre-catalytic spliceosome (complex B) (Figure 2). Interestingly, protein-protein interactions have been identified between SF3B2, SNRNP200 and PRPF8, the latter being proteins implicated in adRP . The identification of SF3B2 as a novel disease gene, shows the potential involvement of other components of the spliceosome apart from the tri-snRNP complex in adRP. Figure 2. Splicing steps and core spliceosomal components of the major spliceosome. The stepwise process includes the generation of the pre-spliceosome complex (complex A), the incorporation of the tri-small nuclear ribonucleoprotein complex (tri-snRNP) to form the pre-catalytic complex (complex B), the initiation of the first catalytic step resulting in the catalytic spliceosome (complex C). The small nuclear ribonucleoprotein 200 (SNRP200), which is required for several dissociation steps during the spliceosome assembly, and several components of the U4/U6.U5 tri-snRNP complex, including pre-mRNA processing factor 3 (PRPF3), PRPF4, PRPF6, PRPF8 and PRPF31 are dysregulated in adRP [adapted from Scotti and Swanson, 2016 ]. Designing a platform for high-resolution copy number analysis in IRD. The goal of this part was to design and validate a robust array CGH platform (arrEYE) to allow the identification of copy number variants (CNVs) in IRD patients, up to the single exon level. Since there is a large clinical variability in RP and genetic overlap with other IRDs, a total of 106 IRD genes were included, being those implicated in RP, cone-rod dystrophies and macular dystrophies. In addition, for research purposes, 60 IRD candidate genes and 196 noncoding RNAs were added to the design . To minimize false positives and negatives, diagnostic thresholds for several parameters were determined. Apart from validation of the array using controls, arrEYE was used to test 57 adRP, XLRP or simplex patients. This led to the identification of a CNV in HGSNAT that results in combination with a missense variant in RP, further supporting its recently identified role in non-syndromic IRD [5, 6]. The arrEYE design proved to be extremely useful to investigate extensively pre-screened patient with autosomal recessive RP (arRP) , Stargardt disease (STGD1) , and achromatopsia . Highlighting the underestimation of CNVs as a cause of IRD in previous studies. With the implementation of next-generation sequencing in a diagnostic setting, we have been confronted with the difficulty of interpreting a vast number of variants found in each patient. To date, variant interpretation is a substantial part of genetic counselling, not only for diagnostic validation, and predictive measures, but also for reproductive decisions such as pre-implantation genetic diagnosis (PGD) and disease prevention (e.g. gene therapy). Only recently, the American College of Medical Genetics and Genomics (ACMG) standards and guidelines were implemented to (re-)classify genetic variants . Although classification results are mostly in line with the outcome of previously used prediction programs and of a literature-based approach, we did encounter difficulties in the classification of variants present in public databases (e.g. gnomAD) . Sharon et., Highlighted the importance of population frequency thresholds to exclude likely benign variants in IRD genes . A statistical framework for a frequency-based filtering was presented by Whiffin et al. and provides an easy and accessible tool to calculate these population frequency thresholds . To date the causality of only a few mutations and disease genes have been refuted, but in time more reports are likely to appear. High-quality variant frequency data of the population studied has become invaluable for the variant interpretation. Some of the clinically reported variants may later require reclassification based on segregation and population frequency data or based on scientific prove (e.g. hypomorphic variants). I once received the following rhetorical question from a reviewer; ‘But what was the clinical utility of running molecular diagnosis if there is no potential cure and the results cannot offer any prediction? Actually the testing result can potentially generate more harm to normal carriers.”- A quote every molecular scientist should reflect on. A molecular diagnosis should not be the end point. Exploring the genetic pathogenesis might uncover clues about phenotypic expression and variability, forming the basis of precision medicine. Technological advances provide great opportunities to further fine-tune the diagnosis. WES is becoming an affordable routine test and by collecting a vast amount of data, it will soon be possible to investigate the effect of the overall mutation load in those patients rather than the effect of a single mutation. A small proportion of patients however will not receive a molecular diagnosis, neither using exome-based sequencing technologies, nor with the arrEYE platform. For those, WGS will offer perspectives to identify hidden genetic variation. Analysing and interpreting the noncoding part and bringing meaningful clinical interpretations to the genetic variants of the genome will be challenging however. In the near future, we can be more optimistic than the cited reviewer. Not only will we find the genetic basis underlying most of the IRD cases, there is also hope of preserving and even improving eyesight for patients with a minimal residual function of (part of) the retina by both gene-dependent (e.g. gene augmentation, antisense oligonucleotide, and CRISPR/Cas9-mediated therapy) and gene-independent therapies (e.g. ciliary neurotropic factors, induced pluripotent, mesenchymal stromal and neural stem cell therapy). There is also hope for end-stage patients: artificial vision based on epiretinal prostheses or subretinal implants, or adding photosensitive proteins to surviving retinal cells (bipolar or ganglion cells) may restore some sight. After graduating in 2009 as a master in Industrial Sciences in the field of Biochemistry and Biotechnology, my career in the genetic field started as a technical supervisor for accredited molecular tests at the Centre for Medical Genetics Ghent (CMGG) in Belgium. The basic ideas of good laboratory practice and of uniformly processing and reporting genetic results has impacted my research. 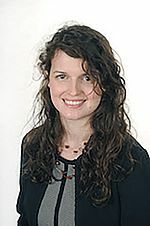 I was introduced in the field of ophthalmic genetics in the research lab of Prof. Dr. Elfride De Baere, first as a research associate, assisting Dr. Frauke Coppieters and Dr. Hannah Verdin, then as a PhD researcher. During my PhD thesis, I was mainly driven by the idea that the research in our group could positively impact the lives of patients suffering from IRD. I was therefore delighted to have the opportunity to start working with Prof. Dr. Bart Leroy as a post-doctoral assistant at the Department of Ophthalmology at the Ghent University Hospital. Van Cauwenbergh C, Coppieters F, Roels D, et al. Mutations in Splicing Factor Genes Are a Major Cause of Autosomal Dominant Retinitis Pigmentosa in Belgian Families. PloS One, 2017, 12(1): e0170038. Hegele A, Kamburov A, Grossmann A, et al. Dynamic protein-protein interaction wiring of the human spliceosome. Molecular cell, 2012; 45(4): 567-580. Scotti MM, Swanson MS. RNA mis-splicing in disease. Nature Reviews Genetics, 2016; 17(1):19-32. Van Cauwenbergh C, Van Schil K, Cannoodt R, et al. arrEYE: a customized platform for high-resolution copy number analysis of coding and noncoding regions of known and candidate retinal dystrophy genes and retinal noncoding RNAs. Genetics in Medicine, 2017, 19(4): 457-466. Haer-Wigman L, Newman H, Leibu R, et al. Non-syndromic retinitis pigmentosa due to mutations in the mucopolysaccharidosis type IIIC gene, heparan-alpha-glucosaminide N-acetyltransferase (HGSNAT). Human Molecular Genetics, 2015; 24(13): 3742-3751. Van Schil K, Naessens S, Van de Sompele S, et al. Mapping the genomic landscape of inherited retinal disease genes prioritizes genes prone to coding and noncoding copy-number variations. Genetics in Medicine, 2018; 20(2): 202-213. Bauwens M, Garanto A, Sangermano R, et al. 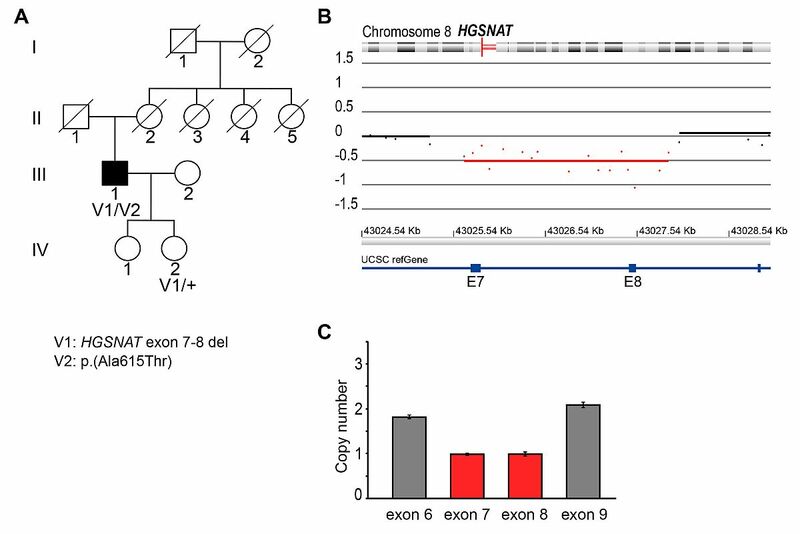 ABCA4-associated disease as a model for missing heritability in autosomal recessive disorders: novel noncoding splice, cis-regulatory, structural, and recurrent hypomorphic variants. Genetics in Medicine, 2019. Mayer AK, Van Cauwenbergh C, Rother C, et al. CNGB3 mutation spectrum including copy number variations in 552 achromatopsia patients. Human mutation, 2017; 38(11): 1579-1591. Richards CS, Bale S, Bellissimo DB, et al., Molecular Subcommittee of the ACMG Laboratory Quality Assurance Committee. ACMG recommendations for standards for interpretation and reporting of sequence variations: Revisions 2007, Genetics in Medicine, 2008;10(4): 294–300. 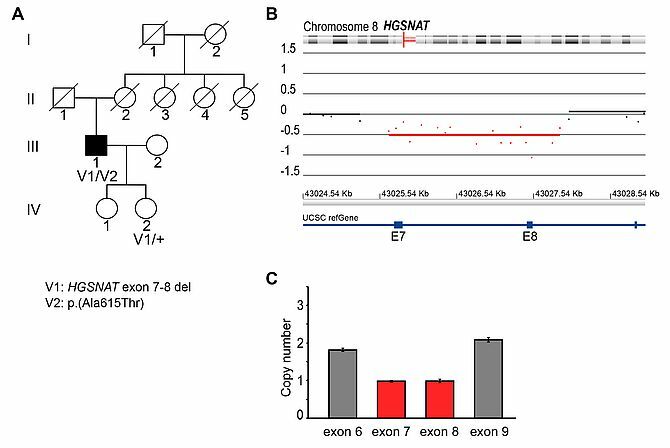 Sharon D, Kimchi A, Rivolta C. OR2W3 sequence variants are unlikely to cause inherited retinal diseases. Ophthalmic genetics, 2016; 20: 1–3. Whiffin N, Minikel E, Walsh R, et al. Using high-resolution variant frequencies to empower clinical genome interpretation. Genetics in Medicine, 2017;19(10): 1151-1158. Cideciyan AV, Jacobson SG, Drack AV, et al., Effect of an intravitreal antisense oligonucleotide on vision in Leber congenital amaurosis due to a photoreceptor cilium defect. Nature medicine. 2019, 25(2): 225-228.